Making a playlist for a crush is an age-old tradition that dates back, I believe, to the invention of the first cassette tape during the Stone Age. (I did not fact-check this.) But now, a few wise-beyond-their-years Twitter users have figured out a new, more literal way to harness the power of a playlist to communicate with a crush. 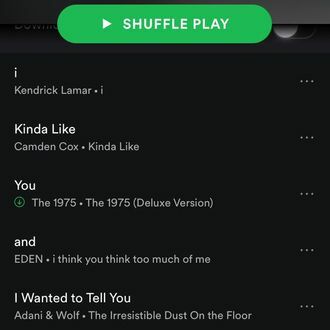 This week’s best meme involves stringing together a message for your crush using song titles. Which, if you do it right, should create a coherent sentence once listed on Spotify. Of course, the meme works better if you’re a little less genuine in your feelings. Or if your crush is on Cole Sprouse’s Jughead from Riverdale or Smash Mouth’s 1999 hit “All Star.” Which, frankly, what is not to love about either. This method also works pretty efficiently for breakups, if you want to go that route. Though, you could also just send them Justin Timberlake’s “Can’t Stop the Feeling” 17 times, a surefire way to let someone know you hate them.